WestJet dips a toe in the trans-Atlantic market with Dublin service; any prospective partners there? WestJet’s decision to use St John’s as a launching pad for a conservative experiment in assessing the potential for trans-Atlantic service is not a huge threat to Air Canada yet. But it does put WestJet’s larger rival on notice that even as Air Canada’s fortunes look to be improving, WestJet does not have any intention of leaving any potential sources of revenue on the table, including trans-Atlantic routes where it can effectively deploy its Boeing 737 narrowbodies. In some ways WestJet’s move is not surprising given that the carrier has previously hinted at international market expansion beyond the transborder and Caribbean and Latin American markets it serves. But as the carrier has previously stressed, any move into a widebody aircraft operation is at least five years off as its immediate focus is on ensuring the successful launch of its regional carrier Encore and continuing to optimise its network. The carrier is, however, opting to engage in an exercise to learn more about the trans-Atlantic market while juggling the addition of several new elements to its business – Encore, new fare bundles centred on a premium economy product and its continuous quest to expand its business passenger base. It also helps make potential European partners aware that there is another Canadian airline bidding for expansion. WestJet’s foray into the trans-Atlantic market gets underway in Jun-2014 when it launches service from St John’s to Dublin on a seasonal basis through the beginning of Oct-2014. The framework of the service essentially entails a one-stop in St John’s from Toronto and Ottawa, which is a new route for WestJet beginning in Jun-2014. Presently Air Canada is the only carrier operating from Ottawa to St John's. It would appear that WestJet's new trans-Atlantic service is taking some aim at Air Canada Rouge, which plans to launch year-round Boeing 767-operated flights between Toronto and Dublin beginning in May-2014. The likely strategy to be employed by WestJet is to offer more attractive fares on the stop-through in St John’s to Dublin versus the direct flight on offer by Air Canada. Both carriers are targeting more price sensitive leisure travellers on the pairing. However, Air Canada will offer a three-class configuration on its aircraft entailing premium Rouge, Rouge Plus and a regular economy option, against one-stop narrowbody service featuring WestJet’s premium economy section that is prominent in the carrier’s higher-end “Plus” bundle. It will be interesting to watch passenger preference unfold as Air Canada weighs the option of matching WestJet’s fares (at least until WestJet’s seasonal service ends in Oct-2014). WestJet will also add some competition to Aer Lingus, which according to schedules in Innovata, has plans to operate Toronto-Dublin when WestJet enters the market. 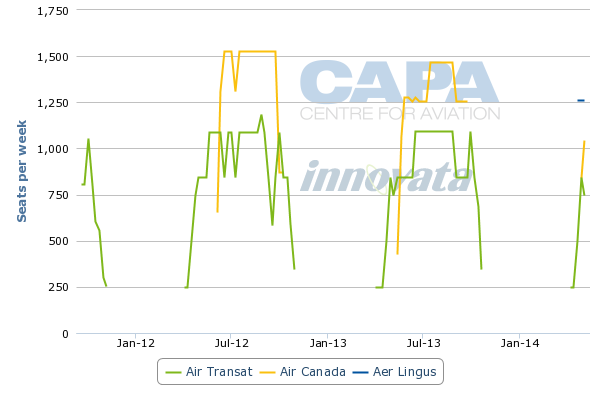 Air Transat has also operated Toronto-Dublin on a seasonal basis. Air Canada not surprisingly is showing no public concern regarding WestJet’s trans-Atlantic move. 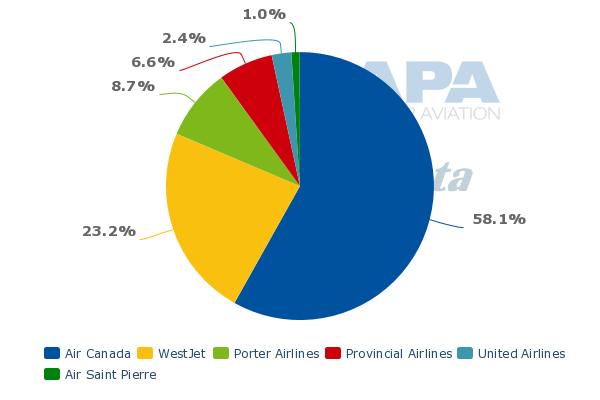 Offering his assessment of WestJet’s planned new service Air Canada CEO Calin Rovinescu in a recent investor presentation characterised the move as interesting, but concluded it is a “non-event”. He remarked that it is an insignificant amount of capacity with a narrowbody aircraft, and noted Air Canada has always encountered a lot of low-cost competition on services to Europe from tour operators Transat and Sunwing as well competitors based in the destination market. Mr Rovinescu also stressed WestJet’s decision to serve Dublin has no bearing on the evolution of Air Canada Rouge. Air Canada also competes with WestJet on service to Latin America and the Caribbean, so it is not as if WestJet’s effort to break into the trans-Atlantic market is an unexpected move. Rouge is Air Canada’s defensive mechanism to ensure it has the proper cost threshold to compete with all the low-cost competition in the medium and long-haul leisure sectors. But it is too early to tell if Air Canada can successfully execute Rouge’s mission. By WestJet’s own calculations (and likely aircraft range limitations) Dublin seems like a logical choice to carry out passenger appetites for trans-Atlantic service. The carrier estimates that approximately 160,000 passengers are expected to travel between Canada and Ireland during summer 2014. And while it seems like the pairing is aimed at leisure travellers, WestJet was quick to highlight that more than 100 Canadian owned companies operate in Ireland and 50-plus Irish businesses operate in Canada. Rounding the statistical logic for the decision to serve Dublin, WestJet also notes that at least 10,000 Canadian work visas will be issued to Irish citizens during 2014. Presently, WestJet accounts for approximately 23% of the one-way seats deployed from St John's, and offers direct service from Toronto and Orlando (with a single weekly flight) from Calgary through Toronto, and also a Toronto-Halifax-St John's routing. Once it begins Ottawa-St John's to feed the flights to Dublin, WestJet will join Air Canada in serving the route. It seems the Ottawa-St John's service might be a way to ensure WestJet garners enough feed for the service to Europe. The carrier also touts that passengers can access 100 European destinations from Dublin, which indicates WestJet intends to possibly leverage its partnerships with its European partners that include codeshare arrangements with British Airways and Air France. Since the recent revealing of plans to launch its first service to Europe, WestJet has also carefully tried to temper expectations in regards to how quickly it will grow in the trans-Atlantic market. Carrier CFO Vito Culmone concluded in a recent investor update the service is a way for WestJet to dip its toe in the market to learn what serving Europe entails, particularly with respect to regulatory requirements. He stated the new flights to Dublin underlie a conservative approach; however, he did note that there are four-to-five other markets where a Boeing 737-700 could be deployed with St John’s as a launch pad. The distance between St John’s and Dublin is roughly 1,781 nautical miles. As previously stated by the carrier, Mr Culmone again cited discussions WestJet has held with Airbus and Boeing regarding the widebody aircraft market. While delivery slots for the 787 and A350 are not available until the 2019 timeframe, lessors have openings prior to that time. But Mr Culmone cautioned that WestJet “has a lot in front of us right now”, as it works to ensure Encore’s success. During the past two years WestJet has embarked on large and ambitious projects in order to diversify its business as it aims to target every possible passenger segment that produces revenue. With Encore, it is attempting to capture some of the CAD2 billion estimated value of regional service in the Canadian domestic and US transborder markets. Through the introduction of its new fare bundles it is furthering its goal of creating products attractive to corporate travellers while still retaining its leisure traveller base by offering various levels of flexibility at corresponding price points. Now that it is on a path to having the Canadian domestic market well-covered through Encore, ample service to warm weather destinations in the US, Caribbean and Latin America and service to key transborder markets such as Chicago and New York, the trans-Atlantic is the next logical step for WestJet. One seasonal route is just about all the carrier can handle at the moment as the development of Encore remains its top priority. But it does signal a new chapter in WestJet’s quickly evolving history, and shows its ambitions to compete with Air Canada on a larger scale. For the moment WestJet is taking a small gamble with its European flights. But it could definitely raise the stakes soon enough. Next steps are likely to involve seeking out potential partner airlines too; indeed, raising the flag of trans-Atlantic operations is the best way of making airlines on the other side of the ocean aware that there is a new potential force that offers them an alternative access route to North America.